In the course of a few days last week your columnist received two letters, in regard to the Old Store at Radnor, that are of such interest that she is using them in this week’s column. The first came from O. Howard Wolfe, who lived in Radnor for 65 years before moving to his present home in Milford, Pa. Still loved and remembered by the community which he served, Mr. Wolfe will always be regarded as one of the most outstanding citizens that Radnor township has ever had. Although Mr. Yocum left Radnor 48 years ago he, too, will be remembered by old timers who lived in Radnor when he was growing up in the Old Store with his uncle and aunt, Mr. and Mrs. Oscar Dillin. To both of these men your columnist extends her sincere thanks for the interest they have shown in the story of Radnor and her appreciation of what they have written in regard to “Your Town and My Town.” Letters giving information such as these do will always find a place in this column, as will any pictures sent to Mrs. Patterson. “l have been reading with great interest and enjoying your articles about ‘Morgan’s Corner’ and old time Radnor where I lived for 65 years. So far as I know I am the only resident of Radnor and a graduate of its High School who served both as President of the School Board (11 years) and President of the Board of Commissioners (eight years, and eight more as a member). “Tryon Steele is probably one of the very few of us now living who knew intimately such old timers as Peter Pechin, Jim Donaldson and Oscar Dillin – just to name a few. Oscar Dillin was an unusual character in his own right and deserves a column of his own. He was the last of the old time country storekeepers who took keen delight, not in being able to advertise the endless list of merchandise he had for sale, but in producing articles which you ‘didn’t know he had.’ He was a unique and remarkable man in many ways. “Did you know how ‘Morgan’s Corner’ got its name? If you look at a map of Delaware county you will note the shape of the northeast section which is Radnor township and see that it is a straight line right angle. This, I was told many years ago by George Righter, another old time character, was Morgan’s Corner and the name did not derive, as many think, from any road meetings or intersections. “My mother having passed away in 1886 when I was 18 months old, my uncle and aunt, Oscar S. Dillin and Emma Dillin, took me into their home, which was, as you call it, the Dillin Store. It was my mother’s wish that my aunt and uncle take me to raise, which they did, and this in itself only shows the kind of stuff of which those good people were made. “Now, let me enlighten you a little on the picture (which appeared June 25). Next to the horse and buggy is one of the finest, in fact they are all fine! Tryon Lewis, Ithan; Roy Yocum, the boy; J.Y.N. 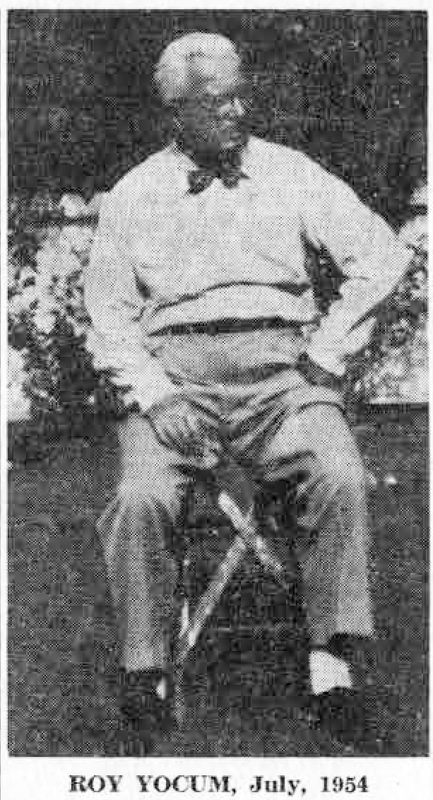 Dillin, Oscar’s brother; Peter Pechin, with cane. “Tryon Lewis would drive out from Ithan every evening for the mail. “Ray Yocum just enjoyed his boyhood days. “John Dillin is 94 years of age and living today at 325 Abbey Terrace, Drexel Hill. Peter Pechin had the farm on King of Prussia road, near Gulph Creek. “Mr. Pechin would walk to the store for his mail every morning, as we had the post office at the store. He was the father of the late Nathan P. Pechin, former sheriff of Delaware county. “You mention Shay’s house – I remember when old Pat Shay died they held a wake for Pat and as a kid, I’ll never forget Pat dead, sitting erect in a chair, in the front room of the house, with candles burning around him. “I have quite a number of pictures and clippings pertaining to the old store which I prize very highly. “George John Dillin wrote ‘The Kentucky Rifle’, of which he gave me a copy in 1946. I have a birthday card for Mr. Dillin, for July 28, when he will be 94. “Could you tell me who was the ‘old timer’ who gave you the information regarding the picture. I have several pictures that were taken by Lucy Sampson. “I left Radnor in 1906 – 48 years ago – so I will send along a snapshot taken last Sunday of myself now, at the age of 69 – so you call see the difference 50 years or so will make in a fellow. “Mr. and Mrs. Louis Goebel, of Berwyn, send me ‘The Suburban and Wayne Times’ quite often and I get great pleasure out of your column. “P.S. The Red Lion Hotel, or Store you refer to, was in Ardmore. Charles A. Dillin had the store here for many years. Charles Dillin was my Uncle Oscar’s and John Dillin’s father! My Uncle Oscar ran the store at Radnor (‘Morgan’s Corner’) for nearly 40 years! Samual Acre Campton was the Postmaster at Radnor Station when I left Radnor In 1906. In the year 1954, nearly 80 years after the Centennial was held in Philadelphia, it is indeed a rare occurrence to talk to anyone whose childhood recollections reach back to one of the greatest celebrations that the city has ever known. George W. Schultz, an old-time resident of Wayne, who is now residing in the Anthony Wayne apartments, is one of the few people who really remembers the Centennial. “Yes, the Centennial Album is a rare thing now… I was 11 years old that year (1876) and well recall the main buildings and their contents, as my father took my brother, Lewis, and me out there two or three times. The Horstman firm (5th and Cherry streets) of which my uncle and he were both members, had a loom on exhibition, turning out small silk pictures of Independence Hall and of Masonic Hall, which they sold as souvenirs. These pictures, about 6” x 10”, were woven in colors. It is interesting to compare Mr. Schultz’ recollections with the notes given in the Centennial Portfolio, not only in connection with the picture of the Japanese building in last week’s column, but also with those of another building known as the “Japanese Dwelling.” This house, during its erection, created more curiosity and attracted more visitors than any other building on the grounds. It was erected by native Japanese workmen, with materials brought from home and built in their own manner with curious tools and yet more curious manual processes. In fact the whole work seemed to be executed upon exactly reverse methods of carpentering to those in use in this country. The building was put together without the use of iron. The different parts were mortised, beveled, dove-tailed and joined, and when it was necessary to use any other fastenings, wooden pins were employed. The woods are of fine grain, carefully planed and finished, and the house, which is the best built structure on the Centennial grounds, was as nicely put together as a piece of cabinet work. So much for the “unique building” which was “one of the most noted curiosities of the exhibition.” While the information does not apply directly to the other Japanese building, from parts of which the Strafford railroad station was built, it is still both interesting and pertinent in that the two buildings were erected by the same group of Japanese artisans. The “Japanese Bazaar”, as the Japanese building which we pictured last week was sometimes called, was built in order to create a market for articles less elaborate and less expensive than those sold in the Japanese section of the Main Building. 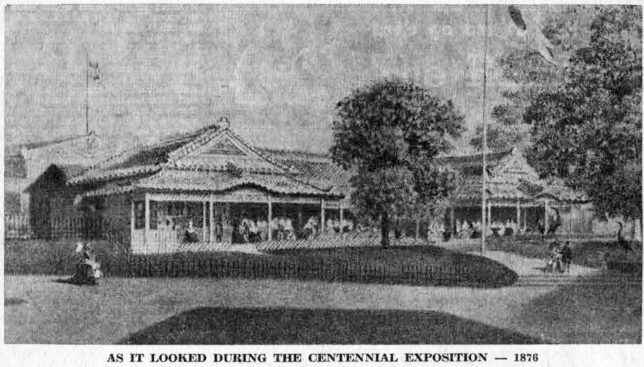 When the Centennial opened, the “Japanese Bazaar” housed many thousands of these artistic, low priced souvenirs of the Centennial. The small piece of ground which surrounded the building was “fixed up in Japanese garden style with flower beds laid out neatly and fenced in with bamboo. Screens of matting and of dried grass divide the parterres… the garden statuary is peculiar. Bronze figures of storks six to eight feet high stand in groups at certain places, and a few bronze pigs are disposed in easy comfort in shady places.” Again, the imagination of the commuter must be called into play as he looks up to see the electric engine of his approaching “Local” with nary a sign of bronze pig or even a bronze stork on the landscape! But even with these exterior decorations left on the Centennial grounds, the wonder still remains that the lumber once used in the construction of the Japanese building at the Centennial could have gone, first into a station, located at Wayne, which was later demolished and then the lumber again put to use in the present passenger station, as well as the shelter at Stratford. And the suggestion of the original Japanese architecture still survives these changes and the wooden pegs are there for all to see! The first time that your columnist heard the story of the origin of the present railroad station at Strafford, it was told her by Mrs. Martha Wentworth Suffren, whose memories perhaps antedate those of any other resident of Strafford. This Wentworth place, with its spacious home surrounded by its 130 acres, gave its name to Strafford station, formerly called Eagle because of the famous Spread Eagle Inn, which then stood in the settlement of Sitersville on the old Lancaster Turnpike. 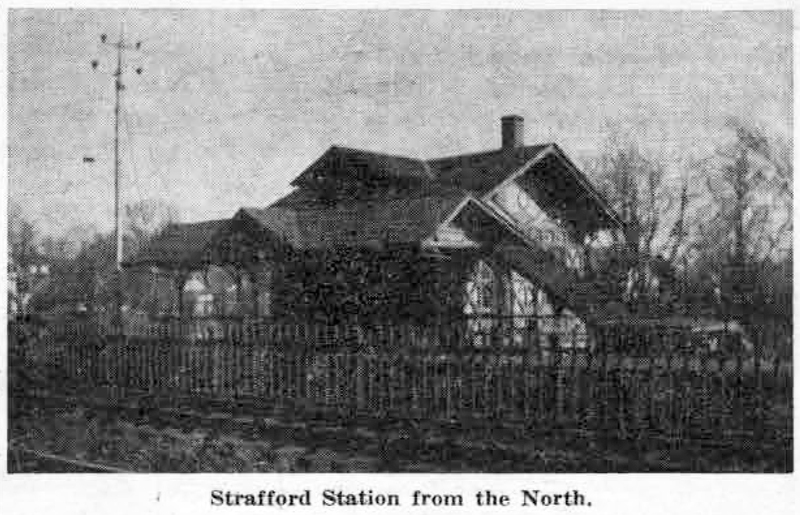 Eagle station was originally located near a grade crossing, about one-third of a mile west of the site of the present Strafford station, at a point where the Old Lancaster road crossed what was then the two track line of the Pennsylvania Railroad. A four-track roadbed was completed in 1886, at which time all grade crossings were replaced by overpasses. Your columnist has since talked to several local residents. 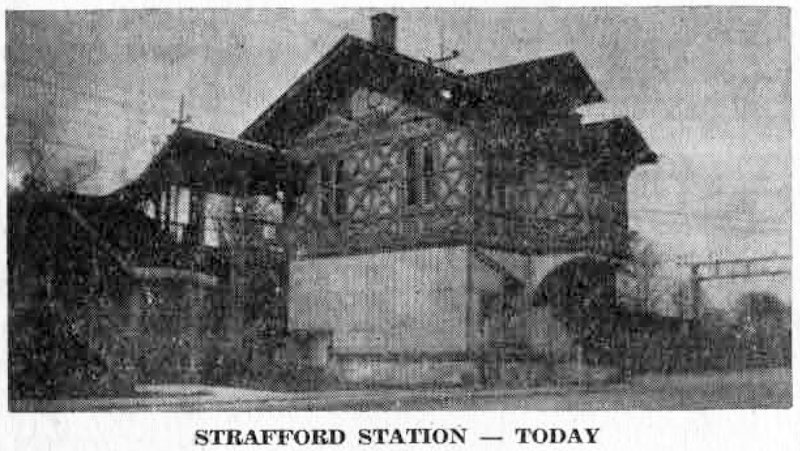 They recall that the building was carefully taken down piece by piece, loaded onto flat cars of the railroad, and moved a mile or so to the west and re-assembled at Strafford. Even to the casual observer, it is evident that these parts made not only the ticket office in the south side of the tracks, but the shelter on the north side as well. The ornate architecture is the same and wooden pegs, instead of nails, have been used in putting both small buildings together. During the four years since your columnist first heard this interesting story from Mrs. Suffren, she has hoped that some day she might find a picture of this Japanese building at the Centennial to reproduce for the readers of this column. A short time ago, George W. Schultz brought forth from his collection of records of a bygone day the “Centennial Portfolio” from which the picture of the Japanese Bazaar illustrating this column has been taken. This portfolio was a souvenir of the International Exhibition at Philadelphia, published by Thomas Hunter, of 716 Filbert street, in 1876.
ln contrast to the picture of the Japanese Bazaar is the very recent one of Strafford station taken for this column by one of its most interested young readers, Robert C. Jones, of Orchard way and Louella avenue. Later installments of this series will describe both buildings more fully. Your columnist spent an interesting evening last week with Mr. Tryon L. Steele of the Township Treasurer’s office, in his pleasant home on Brookside avenue, discussing Radnor as it was in the very early 90’s. 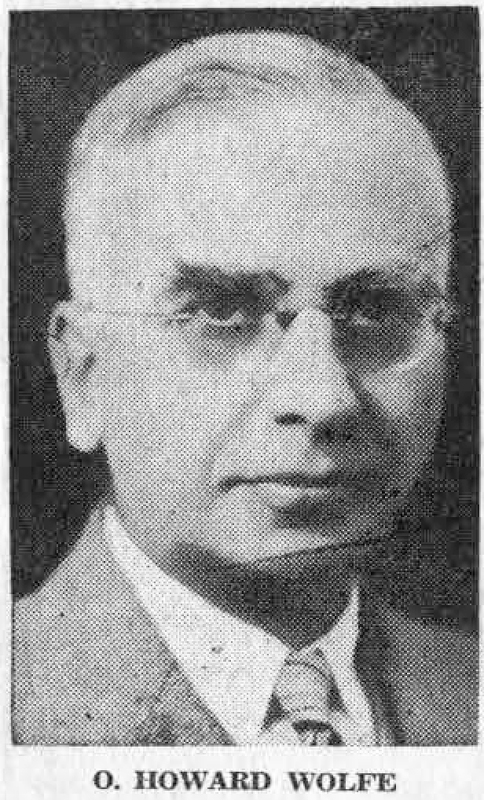 It was at this period that Mr. Steele worked six days a week at the Old Store in Radnor, returning only on Saturday nights to his own home at the Tryon Lewis place, on Darby Creek, in Ithan. The rest of the week he boarded at the Old Store. Ten o’clock was the closing hour on Saturday nights and he still recalls how dark and difficult the ride was between Radnor and Ithan, along an unlighted road, on a bicycle without a light. The first modern type of bicycle was just coming into use at that time, with the disappearance of the less practical and more dangerous “ordinary”, as the early type with the big front wheel was called. Young Steele’s school days, spent first in the school in the Ithan store and later in the “new” school on the present Robert L. Montgomery place in Ithan, were over by then. Although he did not attend one of Radnor township’s earliest schools, that on King of Prussia road, (now Ryan’s service station) he still recalls vividly the small stone building as it looked in the early 90’s with Miss Buzby as one of the teachers. Like many another country stores of its time, this one at Radnor was a friendly gathering place for everyone in the neighborhood. Early in the mornings the farmers drove their wagons to Radnor Station to ship their milk into the city. Afterwards, they congregated in the Old Store for a bit of gossip and a discussion of the news of the day. Mr. Steele remembers particularly Joe Dillin, uncle of Oscar Dillin; John Neary, one or the nearby farmers on what is the Main Line Golf Course; Jim Donaldson and Peter Pechin. Among the customers were Miss Martha Brown, who “was always around”; W.W. Montgomery, Theodore Rand, George Abbott Hunt, the Episcopalian minister; James W. Paul, who then lived in Hare’s lane in the large house that recently burned down. Others were “the Hare boys” from Hare’s lane, sons of Judge Hare; Howard Wolfe, who lived with his parents on Belrose lane, and often came in with his sisters, Katie and Dorothy, and Mr. Jamison, of Reading Market farm. Except for an occasional bicycle, horse drawn vehicles were the only means of local transportation in the 80’s and 90’s. These vehicles varied, from heavy farm wagons to handsome carriages, with a horse and buggy like that shown in the picture the most generally useful and popular. They stopped at the Store, not only for food, feed and merchandise, but for mail as well, for during one Democratic administration, Oscar Dillon was handed what was supposed to be a real “political plum” in the way of the postmastership. Later, however, he was all too happy to relinquish the job and to let the postoffice return to quarters in Radnor Station. By 1800 the original part of the Radnor Inn, which at one time had been the railroad station, was a summer hotel much like the Louella Mansion and the Bellevue Hotel. There were two mills in the neighborhood. A somewhat late industry was an ice cream plant and to the south of the tracks, in the days when Radnor was still Morgan’s Corner, was an ice house where the Old Store always kept provisions behind unlocked doors. John Morgan, son of James Morgan, has been mentioned earlier in this series as being one of the first Welsh Quakers to come to Radnor township. His wife was Mary Davis, daughter of Isaac Davis, of Tredyffrin township. They were among the forebears of many of the prominent families who were later to live ln Radnor township. The name Morgan is found on lists of all the earliest literary and cultural organizations in this vicinity. “Morgan’s Corner”, as Radnor was called after the name “Brookfield” was dropped, was named for Billy Morgan, an old sea captain and descendant of John Morgan, who lived in the first farm house on the north side of Matson Ford road leading from Radnor station. Your columnist once heard the late Nate Pechin tell, at a meeting of the Radnor Historical Society, an amusing story of this Captain Morgan and a prize Arabian horse which he owned. He was very anxious to show this animal to his mother, and, undaunted by the fact that this elderly lady was bed-ridden, he led the horse up the steps to the second floor. Apparently this was not too difficult a matter. But to return the animal to the ground floor was something else agaln. At this same meeting he told of his father, Peter Pechin, who as a boy knew a Joseph Smiley, of Radnor, who, “when he had been a young lad had accompanied his father to Valley Forge with corn for the Continental Army. An Indian trail to Valley Forge ran behind Ann Pechin’s spring house off King of Prussia road (the old Dorrance Estate). This trail was used by local farmers who went in secrecy up into the valley to take provisions to Washington’s army. Still another bit of interesting information given his audience that night by Mr. Pechin concerned an iron ore hole worked in the early 19th century. This was in a hollow on Eagle road opposite the Dorrance place. After the ore was removed it was carried to Benjamin Brooke’s place ln Gulph Mills to be made into tools. This same Brooke was a retired Revolutionary War captain who lived at “Elderbrook”, the Henderson Supplee house on Matson Ford road. The first map shown in today’s column is part of a rare old real estate map of Radnor township made in 1873. 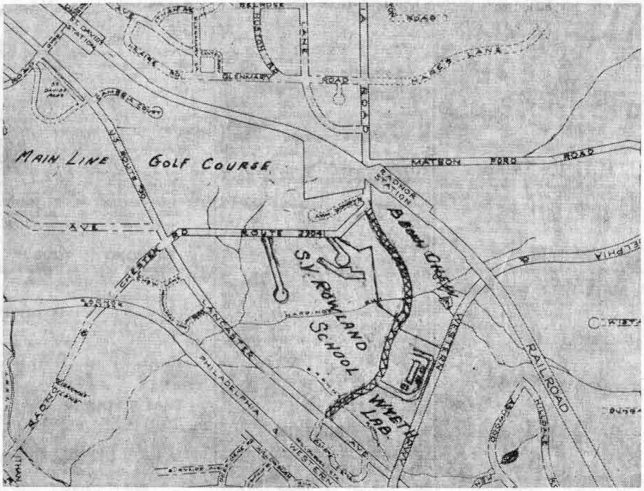 The second map, which is a small part of the most recent Radnor township map, shows almost the same section as it looks 81 years later. The comparison makes an interesting one, especially in view of the location of the new Sydney V. Rowland School, the Wyeth Laboratories and the Main Line Golf Club, which is the site of the proposed new shopping center for this section of the Main Line. 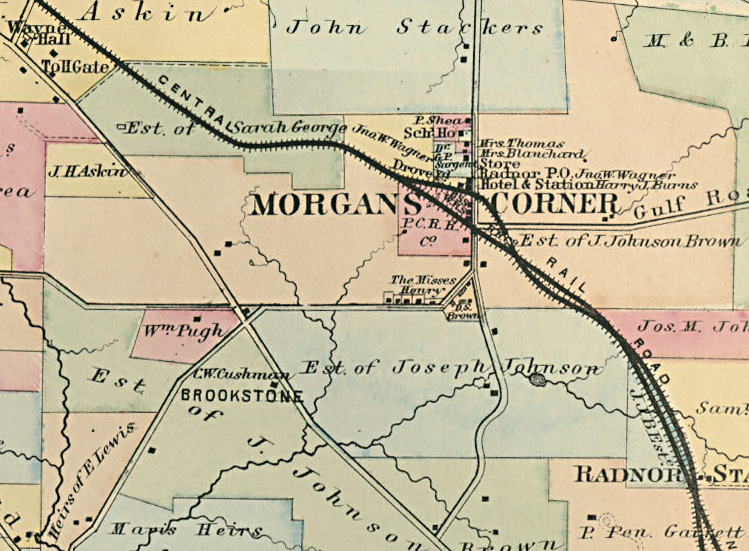 The center of interest in the first map is Morgan’s Corner Station, the importance of which is emphasized by the fact that the size of the lettering on the map far exceeds that of any other point in the whole township. Radnor Station of 1873 was considerably to the east of Morgan’s Corner, as is clearly shown on the map. According to old railroad records it was only a year after this map was made that Morgan’s Corner became Radnor, and the small station called Radnor on the map was renamed Upton. About a year after this the Upton Station was torn down. The present Matsonford road, which joins the old King of Prussia road at right angles, just to the north of Radnor Station, was called Gulf road on the 1873 map. King of Prussia road takes the same course now as then, passing the Old Store, then the railroad, and after that making a rather sharp turn to the right before taking a straight course to Lancaster Pike. The first map shows that several of the houses that still stand on the right side of King of Prussia road at the turn were there in 1873, as they had probably been for many years before. This well-known turn in the road is marked by these houses on the right and by the high wall of the Chew estate on the left. The Joseph Johnson estate formerly owned the large acreage later acquired by the Benjamin Chew family. This acreage extended from the Pennsylvania Railroad tracks to Lancaster avenue, and then from Lancaster avenue south almost to Conestoga road. A large plot, bounded by Lancaster avenue on the south, and by King of Prussia road on the west, has in recent years, been sold to the Radnor Township School District. The site of the new Rowland School, with its school field and the wooded section directly on the Pike is indicated on the second map. Between the Philadelphia and Western tracks and the school is the site of the Wyeth Laboratories, on which construction has recently been started. The ownership, in 1873, of the plot of ground now occupied by the Main Line Golf Club, is not quite clear on the old map. Part of it seems to have belonged to the estate of Sarah George, with a small portion in the possession of the Pennsylvania Railroad. The holdings at that time of Henry Askin, builder of the Louella House, were so great that his property adjoined the George holdings to the west.